Aluminum (Al) is a relatively soft, durable, lightweight metal and forms strong chemical bonds with oxygen. It is difficult to extract from ore, such as bauxite due to the high reactivity of aluminum and the high melting point of it’s ores. 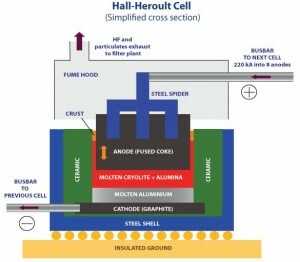 The Hall-Heroult process became the major industrial process for aluminum extraction, making it cheaper for extracting minerals and is now the principal method used world wide. Today, aluminum is the most widely used non-ferrous metal: from trains, planes and automobiles, to cans, labels and tables, aluminum is (almost) everywhere we are. But, it was mind before metal for Paul Louis Toussain Heroult, who was sent to England in an effort to make him mind his p’s and q’s. Post boarding school (he was expelled) but, Heroult would later become the lad who led the way for creating of many all-things-American we now take for granted: cans that coca-cola comes in, foil for back-yard barbeques, and, things recyclables are made from. In England, Heroult lived with an aunt first, then was moved to a strict religious boarding school with hope he would be more inclined to change his mischeivious ways, settle down and, focus on becoming a good student instead of the rebellious one he was. 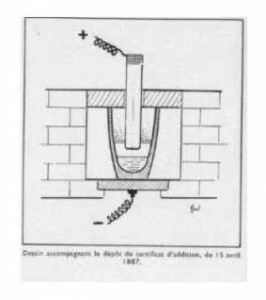 After his father died, Heroult inherited his father’s tannery buildings which he decided to use for experiments. 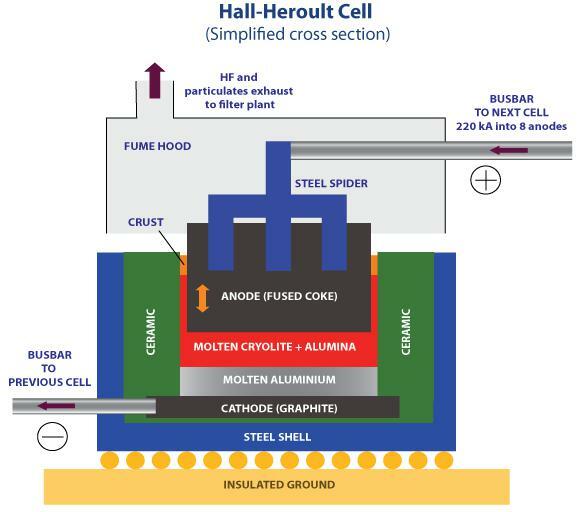 In the Hall-Héroult process, alumina is first dissolved into molten cryolite with calcium fluoride and then electrolytically reduced to aluminum at a temperature between 950 and 980 °C (1,740 and 1,800 °F). Cryolite is a chemical compound of aluminum and sodium fluorides: (Na3AlF6). Although cryolite is found as a mineral in Greenland, its synthetic form is used in the industry. The aluminum oxide itself is obtained by refining bauxite. Never discouraged, Heroult, was said to work “as one possessed”, and continued to work passionately with fervor on new discoveries and inventions, determined to improve both quality of the products and profitability of the operation. But, on May 9, 1914, at age 51, the man who was said to have total confidence in the future and an overflowing imagination, died of Typhoid fever. Paul Louis Toussaint Heroult is also credited with the invention of the Electric arc furnace (EAF) used in the production of steel.